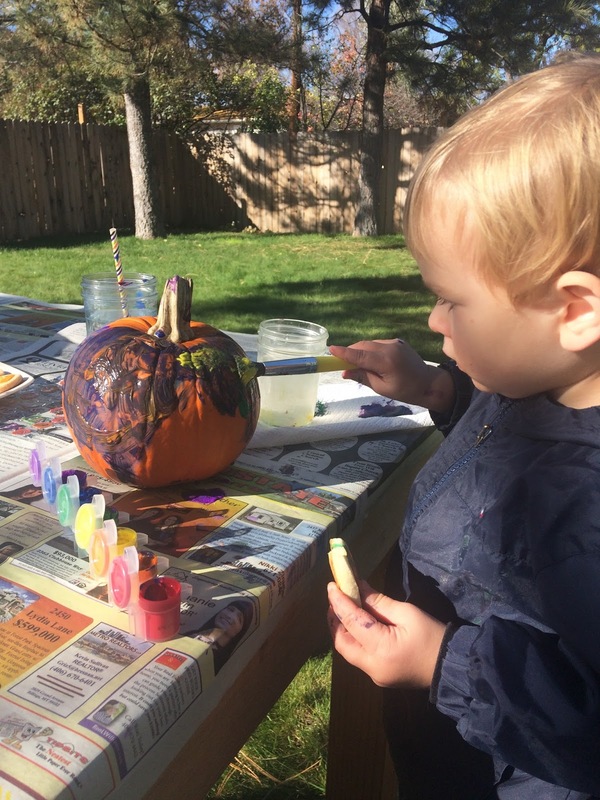 When I made our fall bucket list a pumpkin painting party was at the top of my list. 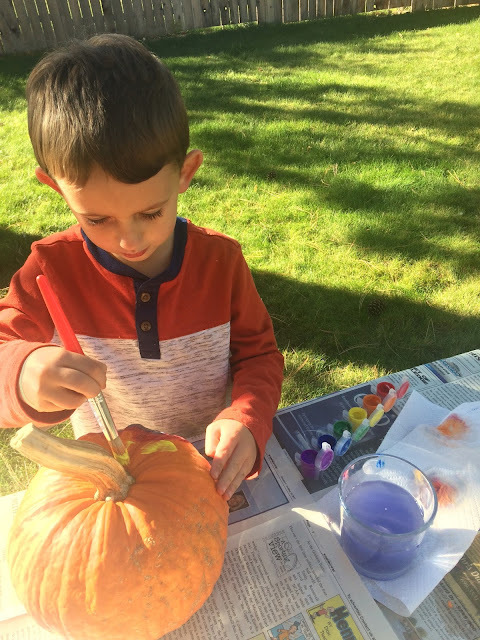 I started painting pumpkins with Kona, when I was pregnant with Kai, for a easy but fun craft. He loved it so much, that now we paint several every year. This year we decided to have our favorite neighbor girls over for a little party. I couldn't wait to introduce Kai to our yearly tradition, I just knew he was going to love it! So, on Friday afternoon, we got our painting on. 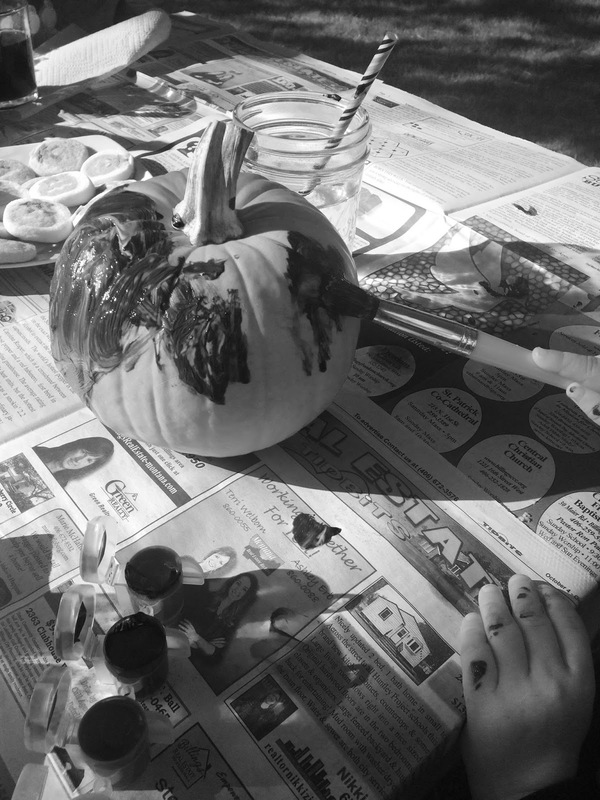 I grabbed 4 smaller pumpkins when we went to the pumpkin patch last week, laid out newspaper on our outdoor table, got some stickers, washable paint and goodies. For snacks I made pumpkin cookies, popcorn and chocolate chip teddy grahams. I not sure how many cookie Kai had, but I know it was over 5 (enter monkey covering his eyes emoji here). Every time I turned around he was grabbing another one. Talk about a sugar high, aka crazy man! The kids had a blast and Kai loved slathering his pumpkin with as much paint as possible. :) After they were done painting pumpkins a fake water fight broke out. They all had a water gun and were chasing each other around the yard pretending to spray each other. I'm not sure who started it, but I'm pretty sure it was my husband. He was right along with them, chasing them and encouraging the craziness. It was a sugar high at it's finest! :) Thank goodness for husbands though, because Kery and I got to sit down and talk while nobody bothered us! It was a magical afternoon! 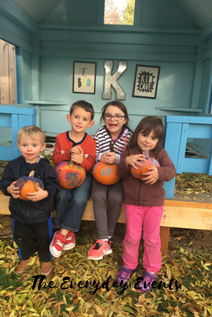 Our 4 cuties with their painted pumpkin. They are the sweetest friends and I love watching their friendship grow. We are in so much trouble when they all hit the teen years around the same time! I hope everybody has a wonderful day! I'm off to Hobby Lobby to pick up circus party supplies because someone special is turning two! To see more of our everyday events follow us on Instagram. 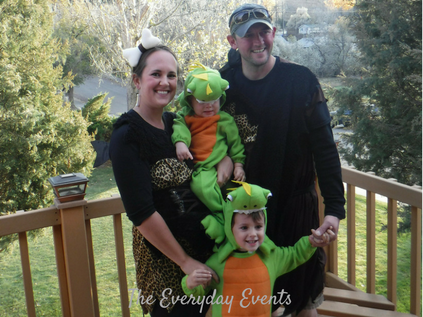 If there is one thing I love, it's family themed Halloween costumes. I seriously get so excited and can't wait to start planning our costumes every year. I start scouring Pinterest in August and wish we could have multiple costumes every Halloween. There are so many adorable themes to pick from! My Dad's birthday is on Halloween, so growing up Halloween was more of a birthday party than a spooky night of crazy fun. 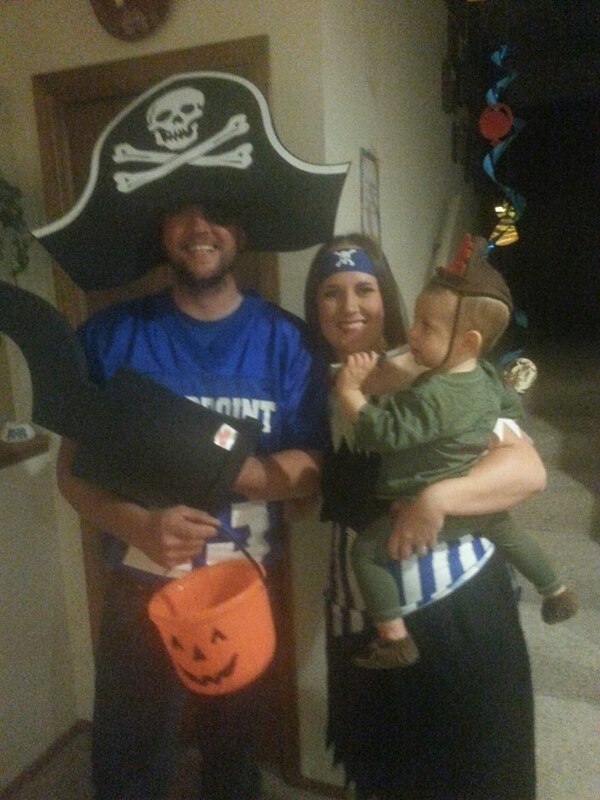 Now that I'm older I love living vicariously through my kids and torturing my husband with costumes. 😉 I think he secretly loves it! If you are looking for any costume ideas or inspiration here is a little throwback. 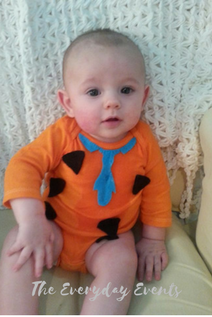 For Kona's first Halloween he was Fred Flintstone! This was the only year we didn't do a family themed costume and I'm a little bummed we didn't. Since we didn't go trick-or-treating I didn't even think about dressing up. Oh well, this little cutie stole the show! To make his costume I took a white onesie and dyed it until I got the orange I wanted. I then cut out the spots and tie from felt and hot glued them on his onesie. I can't get over his little bald head and big brown eyes. They get me every time! 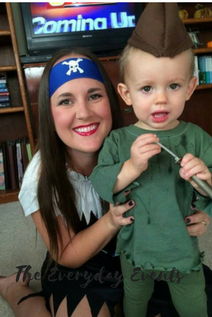 The next year Kona dressed up as Peter Pan and J.D. and I were pirates. I really wanted to be Tinkerbell, but couldn't find a costume I loved for a reasonable price. I'm glad now we both went as pirates because I love how our costumes turned out. J.D. 's high school mascot was a Pirate so he wore one of his old jerseys from football along with an eye patch, ridiculously huge hat and hook. It was so fun and my husband thought of it all himself! I make Kona's costume again my dying a long sleeve shirt and a pair of girls leggings dark green. I then cut the bottom of the shirt and sleeves to give it the same look as Peter Pan. The hat was a little tricky, but it turned out really cute. I just took felt, cut out two sides, hot glued them together, folded up the bottom and glued it as well. I then attached the feather, also made out of felt, and a brown stretchy strap to go under his chin. Sorry about the grainy picture! It's the only one I have of the three of us. I loved our costumes in 2015 and it all stemmed from Kona's obsession with elephants. He use to love elephants so much and I knew he would flip when he got to dress up as one. The day his costume came in the mail, I had him try it on make sure it fit and he wouldn't take it off. J.D. had to take him to the bank in his costume. 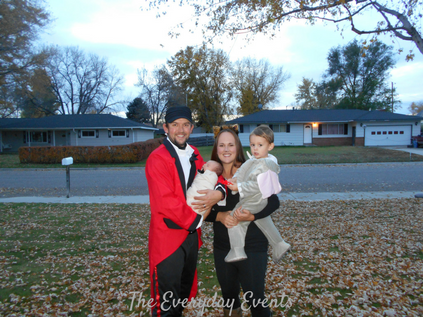 Kai was a little over a week old so he went as a peanut, I was a tiger and J.D. was the ring master. 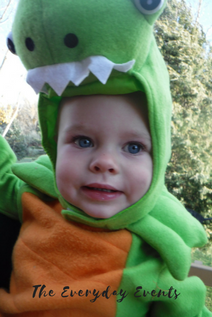 I was so excited to go trick or treating I could hardly handle it. After we took these pictures we jumped in the car to head to my Dad's neighborhood and Kona threw up all over himself. After he threw up he was fine, but his costume was ruined. 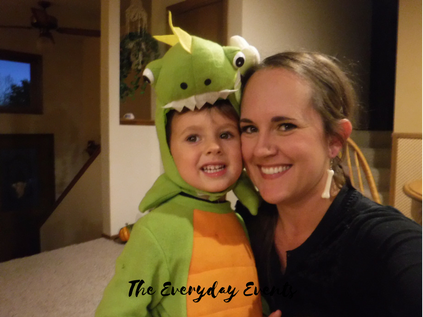 #momlife I have to admit I was bummed, and nobody but our neighbor got to see our costumes. We still had a great night watching Casper and handing out candy. Thank goodness we took pictures before we left for my Dad's! Last year our costumes came from Kona's obsession with Dinosaurs. Do you see a theme here?! I loved our costumes so much and especially loved having bone earrings and a huge bone in my hair. Oh the things we do for our kids! Kona smiled ear to ear all night and had the best time trick-or-treating. Since we didn't get to go the year before he didn't have any memories of it. He couldn't believe he got handfuls of candy from every house he walked up to. I'm sure he thought his parents had lost their minds! I can't wait for this year's family themed costume. All the costumes are planned out and spoiler alert, it's once again something Kona is in love with. Next year it will be Kai's turn to pick, I promise! I would love to hear what your favorite costume is you've ever worn! The countdown is on, Halloween is in 19 days! To see more of our Halloween fun, make sure to follow us on Instagram! Two years ago we were anxiously awaiting our sweet boys arrival and I was trying my best to not panic. I was beyond excited, but scared to death about taking care of a newborn and a two year old. Looking at these pictures takes me right back and floods me with emotions. What I would give to go back in time and feel Kai kicking while snuggling two year old Kona. I'm so happy we have these moments in time captured to look back on and remember this amazing time in our life. If you are pregnant I can't recommend maternity pictures enough. You might not feel your best or feel up to getting ready and taking pictures, but you will be so happy you did. 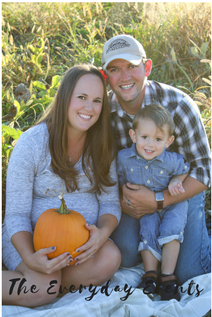 Having my big belly, that was the size of a pumpkin, captured are some of my favorite pictures ever. 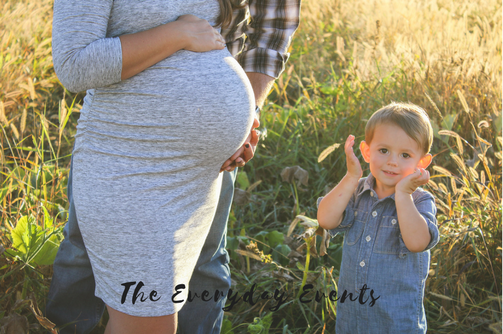 I hope these pictures gave you some inspiration for your fall maternity pictures! A huge thank you to my girl Amber, for taking these amazing photos. We are still completely in love with them and will cherish them forever. Follow us on Instagram to see more of our everyday events! Happy first Friday in October! I'm so excited my favorite time of year is here and I'm already panicking a little that it's the 6th. Does anybody else do that? I don't want October to end. 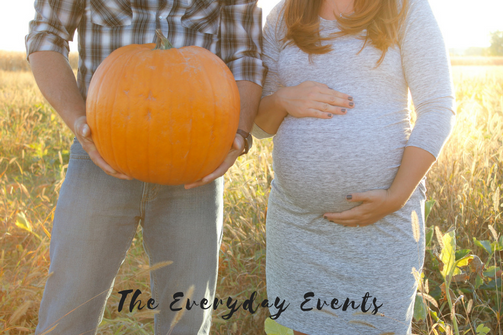 We have so many fun things planned this month and I want to soak in every crisp, pumpkin filled moment. I blogged about our fall bucket list last week and I'm determined to check off every item, and trust me there's a lot! I wanted to take a minute to send all of my love to those families affected by the violence in Los Vegas. My heart hurts for everyone who lost their loved ones. My thoughts and prayers are with you. I urge everyone to do something out of love and kindness this weekend. Taking cookies to neighbors, visiting a nursing home, sending a letter to a loved one, taking food to the food bank. If we want to see change in the world, we need to be the change. Love one another and remember that love will always win. 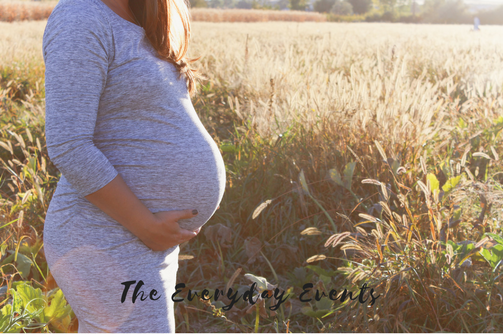 As always I'm linking up with Andrea, April, April, Lauren and Katie to share our Friday favorites. Let's get this party started! Kona and I have been getting our craft on in the afternoons while Kai is napping. It's one of my favorite times of day and I look forward to some one-on-one time with my sweet boy. Both crafts were super easy to make and didn't take much time. If you are looking for a fall craft give them a shot. I also have tons of fall crafts on my fall Pinterest board. I did a little shopping this week at Old Navy and got these pants and this flannel shirt. They are both really comfy and flattering. I love the flannel shirt because it can be worn a ton of different ways. I know they will both be on repeat all season long! I finally got a massage yesterday and it was amazing. I haven't had one since I was pregnant with Kai and it reminded me that I need to make them more of a priority. I have been getting headaches everyday for weeks now and it's because my shoulders are so tight. I'm hoping that getting all the knots worked out will help. If you haven't had a massage lately make an appointment! You won't regret it! I need some major help figuring out a color for our kitchen cabinets. Since we moved in I haven't been in love with the cabinets or counters, but redoing them isn't in the budget right now. I was thinking about using chalk paint and painting the cabinets, but I'm loss at what color to pick. I took these pictures last night and the wall color looks way darker than they really are. The real color is a very light gray. Based on how dark the floors and counters are, what color should I paint the cabinets? I really like them all and need help narrowing it down. I'm not set on any of these colors though so if you have something else in mind I would love to hear it! So which one is your favorite? Help!! I hope everyone has a wonderful October weekend! My favorite season is upon us and I couldn't be more excited! I seriously get giddy during this time of year and love celebrating any way we can. 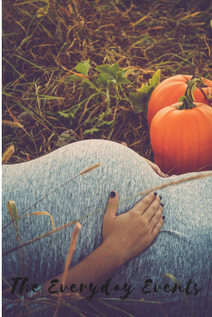 Think lots of pumpkins, baking, activities, walks, and crafts. I just can't get enough! The house is decked out in fall and Halloween decorations and the boys' room is no exception. 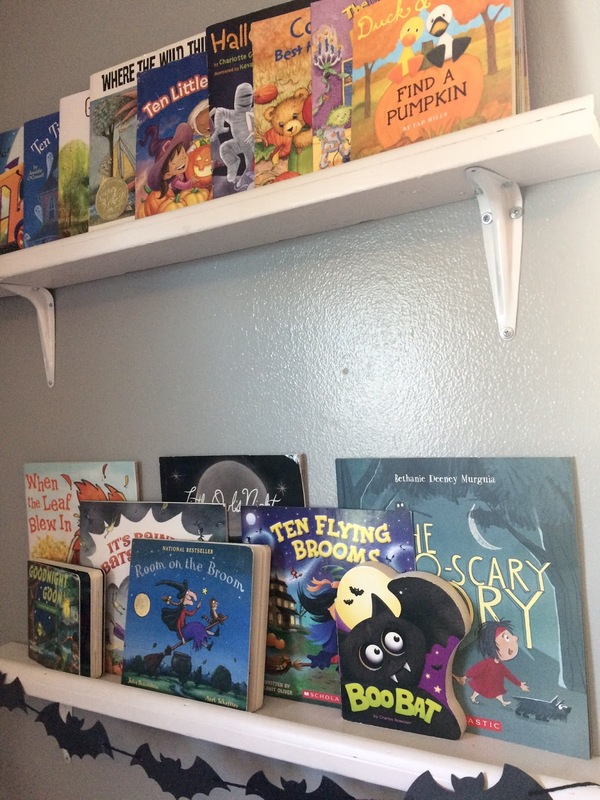 Bats, books, and pumpkin lights give their rooms the perfect festive touch. 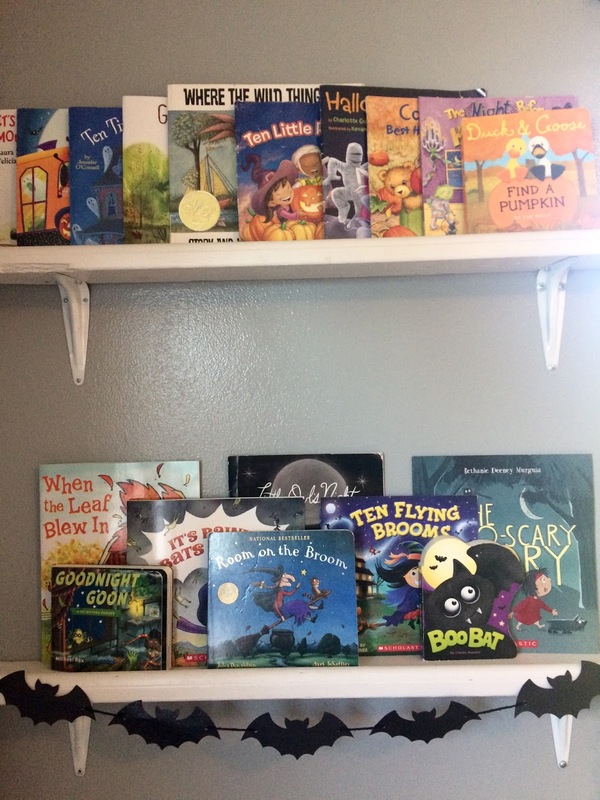 We love reading Halloween books all month long, and I secretly look forward to reading The Room On The Broom all year. It's one of my all time favorite children's books. I wanted to share all of our favorites because these books are too good not to share! Our absolute favorites are Room on the Broom, Halloween Hustle, Ten Little Pumpkins, Goodnight Goon and The Night Before Halloween. We have had them for years and I still love reading them. That alone is a major win! Kona picked out The Too-Scary Story, It's Raining Bats & Frogs & Goodbye Summer, Hello Autumn this year and they are really cute with the best illustrations. These books plus Hocus Pocus help us get excited for Halloween all month long. Because in this house we celebrate as much as we can! :) I hope this list helped you find something to add to your collection. What are you reading this fall? I'm always looking to grow our little library! 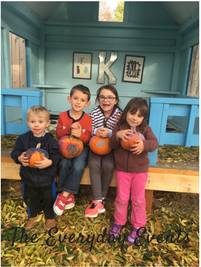 Check out our fall bucket list to see all the festive fun we have planned! To see more of our everyday events make sure to follow us on Instagram. Have you ever had one of those days where you need a time out? You feel weary, exhausted and your heart feels a little heavy. You keep spinning your wheels and feel like you aren't getting anywhere. I certainly have those days, and some weeks I have them more than I would like to admit. 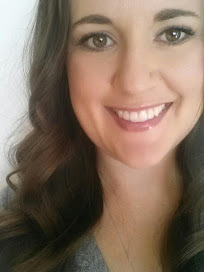 My Husband's crazy work schedule, plus having two little boys close in age, can leave me feeling run down. Motherhood is hard and those who say otherwise aren't telling the truth. Giving all of yourself 100% of the time is not easy. Some days I want to cry when there is one more mess to clean up at 7:00pm, or my boys aren't listening for the 100th time. We all have our own ways of dealing with the exhaustion, but one thing I tell myself is, this season of motherhood will not last forever. 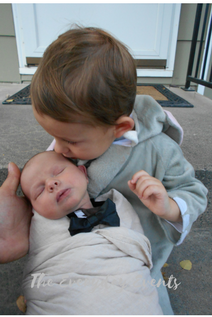 I remember how difficult it was as a new mom and in the early stages of having two boys. I couldn't help but wonder if I would ever sleep again or shower without Kai crying. The first time I took both boys to the zoo, which was my first major outing by myself, I cried before we even left the house. I was so overwhelmed with feedings, trying to get us all ready and sticking to a schedule, that I broke down crying when I couldn't find Kona's shoes. 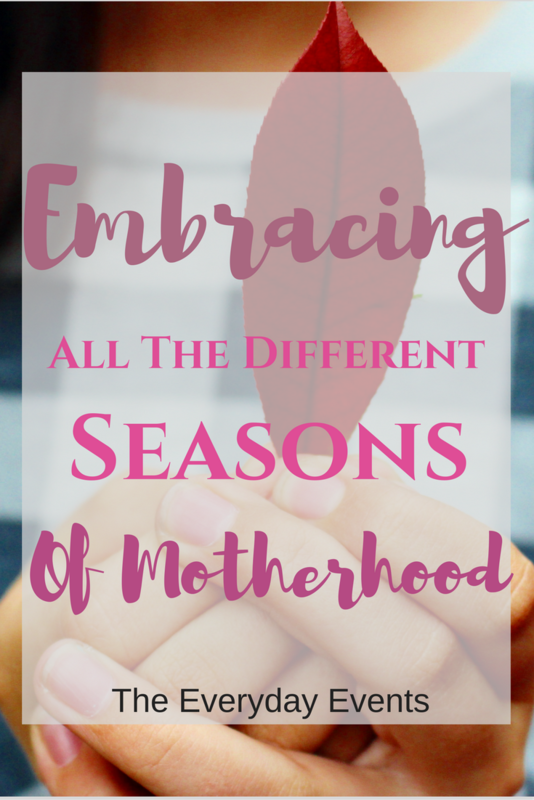 That season of Motherhood has come and gone, as well as many others. Just as this season will change and morph into the next. There is the season of sleepless nights, adjusting as a new family, not showering as often as we should or eating a warm meal. The season of terrible two's and all the frustration that comes with your child wanting to be more independent. The season of school aged children and wondering how they grew up before your eyes. There is the season of wondering if we are doing this motherhood gig the right way, crying because we have be driven to our breaking point, and losing our patience sometimes more often than we would like to admit. Above all this, motherhood is the season of pure love, happiness, joy and giving all of ourselves to our children. Motherhood is the most rewarding thing I have even done and I don't want to spend my time wishing this season away, even on the hardest days. We don't know what the next season of Motherhood holds. We can look forward and guess what the joys and hardships will be, but we won't know until we get there. One thing is for sure, there will never be a season of Motherhood without trails. 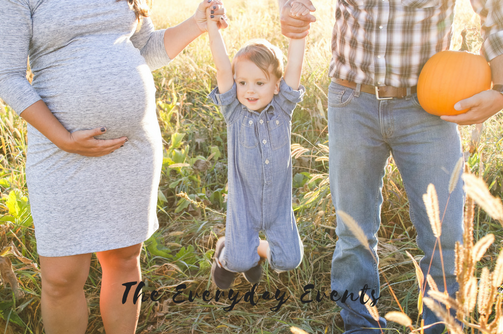 This season of motherhood may be difficult, but it is important to embrace it and find joys in the little things. Remember that it will not last forever, no matter how difficult it may be. Milk spilled for the 10th time, kids fighting, a huge pile of laundry, and kids hanging on your legs while you try to cook dinner will all pass. And when it does, you might look back and wish for it back. Fall is underway & I couldn't be more excited! I have always loved Fall and go a little nuts during this time of year. There is so much to do and I want to do it all. Making seasonal bucket lists is one of my favorite things to do. And now that Kona is able to help come up with ideas it's even more fun. We talked about all the fun things we did last year and we both got super excited for this year. He is already asking me every night before bed if tomorrow is Halloween. He get's it from his Mama! :) We are patiently waiting to go to the pumpkin patch, or two, or three and carve pumpkins. Since I was a little girl it's always been one of my favorite nights of the year! Not only do I love Fall for the sweaters, booties, pumpkin everything, and traditions, but it does something to my soul. I feel re-energized and inspired by the crisp air, gorgeous colors and leaves falling all around. I savor the moments a little bit more and thank God for all we have. 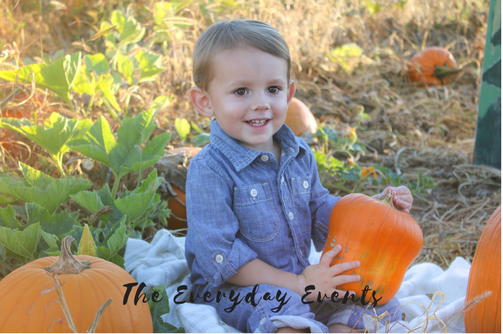 I love this season so much and hope to make it our favorite fall yet! "Ah, September! You are the doorway to the season that awakens my soul"
Celebrate J.D. and Kai's birthday's. Fill the front porch with mums and pumpkins. Have a bonfire and make s'mores. Drive through the country and enjoy the Fall colors. Jump into a pile of leaves. Have fun bowling with pumpkins. Watch Hocus Pocus and Casper on repeat. Road trip to watch our favorite college football team. Donate to the food bank. Have soup Sunday every Sunday. Bake as many pumpkin treats as possible. 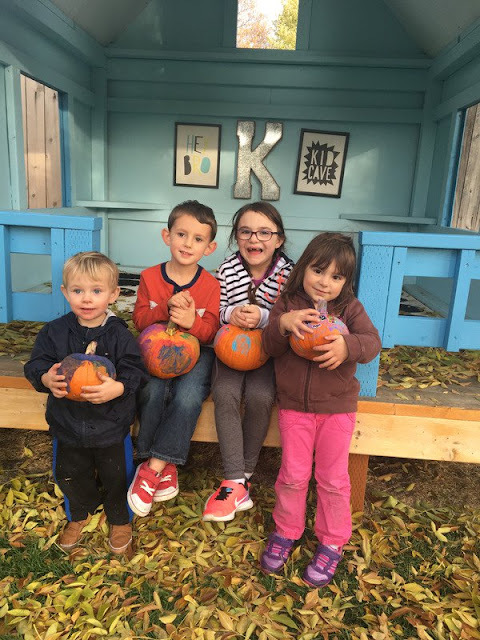 Visit a pumpkin patch, or two, or three. I wasn't lying when I said I want to do it all. :) Hopefully we can check all these times off our list and make many, many memories along the way. I would love to hear what's on your bucket list!! To see all of our fall festivities make sure to follow us on Instagram! 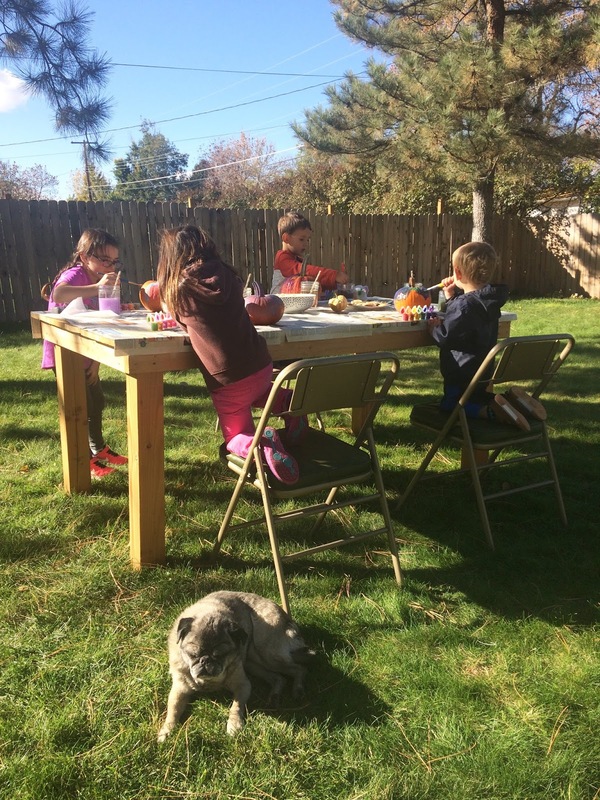 Check out my Pinterest boards for more Fall fun! 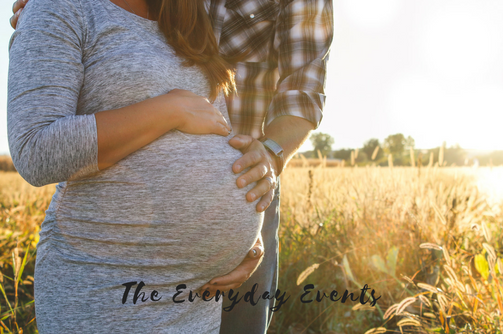 Welcome to Everyday Events! I’m Erin and I’m so happy you’re here! I love holidays, celebrations and making everyday special for my family. Life is so beautiful and I can’t wait to share ours with you!